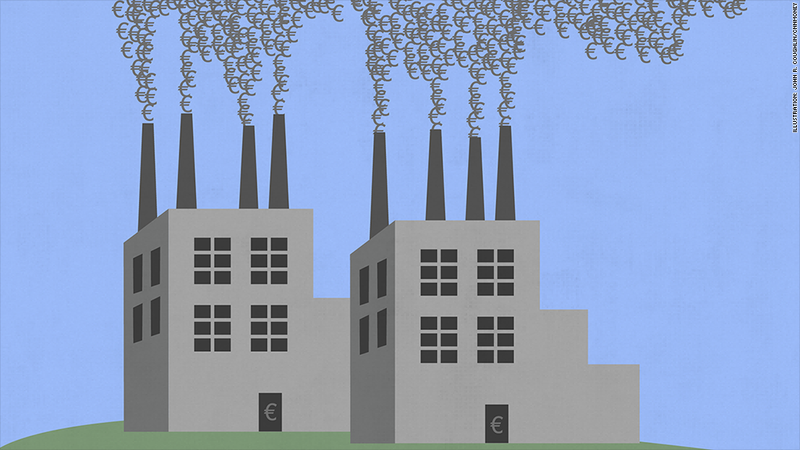 Germany has the most high-pollution factories in the European Union. Air pollution costs Europe up to $235 billion a year -- roughly the GDP of Connecticut. A report by the European Environmental Agency released on Tuesday considers the dangers of air pollution -- including premature deaths, medical costs, lost work days, infrastructure damage and lost profits on agriculture. The costs add up to $457 per person (or 368 euros) every year. But the effects of air pollution go far beyond that. The agency estimates more than 400,000 Europeans die prematurely due to air pollution every year. The report, based on data from 2012, points finger at 30 facilities across Europe that cause the worst damage to the environment. The overwhelming majority are power plants, fueled mostly by coal. Eight are in Germany, six in Poland and four in Romania. The U.K. and Bulgaria have three each. The German energy giant RWE (RWEOY) runs four plants from the top 30 list -- more than any other company. Germany's emission records have worsened over the past three years as the country has been phasing out its nuclear power plants following the Fukushima disaster in 2011. Germany, Poland and the U.K. were among the countries with the highest financial burdens overall, but three post-Communist countries -- Bulgaria, Romania and Estonia -- suffered the worst costs relative to their GDP. The agency, which advises European lawmakers on regulation, said Europe could save up to $40 billion if the European Union's 1,500 largest factories followed the regulations that are already in place. But environmental pressure groups in Europe paint a negative picture. A recent report by the World Wildlife Fund showed CO2 emissions from coal plants in Europe are on the rise due to lower coal prices.